This immaculate UNFURNISHED ground floor ONE BEDROOM flat with garage is situated in Richmond Court, Newton Hall Estate on the edge of Durham city giving easy access to the city center and being ideally located for access to the A1(M) and it's links to all major NE towns and cities. Entry is from the rear with a small open plan grassed area and space for a washing line. Double glazed rear door into the hallway with doors off to the bathroom and lounge. Large light and airy lounge with wooden flooring and large picture window with vertical blinds. Doors off to the bedroom and kitchen. Kitchen with white units and pine effect benching; stainless steel circular sink and drainer; white slot in electric cooker. Auto washer and fridge freezer provided. Laminate flooring. Combi boiler for instant hot water and central heating. Bathroom with white 3 piece suite and over bath shower. Vinyl flooring. Double bedroom with sliding door fitted wardrobes and laminate flooring. 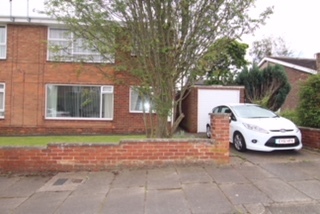 To the front aspect of the property is a single garage with up and over door; driveway for parking and a garden laid to lawn. 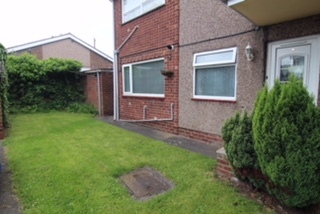 Advance rent £450 and bond £450 required. If you think you will fail a credit check a Guarantor can be used. PLEASE NOTE non-UK residents must provide a Guarantor or can pay the full years rent in advance if preferred.